Leeds punk-funk upstarts ¡Forward, Russia! are doing it for themselves, taking the music industry by storm - all on their own terms. Whilst the band themselves out-rightly refuse to try to tie down their sound, merely saying that they’re dedicated never to getting stuck in a rut, their act has been described by the authorities as ‘Convulsing punk-funk brilliance’made up of ‘floor-filling disco punk funk party music, epic post-rock and larynx scorching yelps,’ which, even in the Red Bull frenzied world of music journalism, passes for high praise. More than befriending NME, XFM and Drowned in Sound, the band is distinctly pulling its weight on the live circuit, and seems to have a reputation for taking over Leeds music scene. Shafting the whole genre of modern indie-pop, the band are an ‘indie band’ in the literal old-school sense, not going the big labels in order to maintain artistic and financial control, releasing their material entirely on their own label Dance to the Radio. What’s more, instead of giving their tracks names the band has eye-catchingly titled each track by the order that they were recorded in. Whiskas, the member of the band responsible for guitars, shouting, and the label, explains, “There’s a kind of No Logo idea at work, where you’re meant to look at the actual object rather than the way it’s presented. In a way titles don’t really matter, where people refer to the tracks rather than the song names. It’s just a way of cataloguing your output, and this is an ultimate conclusion of that.” So far ‘Twelve’, and ‘Thirteen/Fourteen’ have been released as singles, whilst ‘Nine’ is causing a bigger stir on its release. Whiskas is quick off the mark to deny that the band's name is in actuality an ironic reference to Stalin's abandonment of the Republic in the Spanish Civil War. 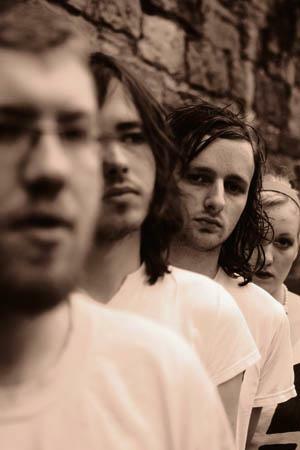 All the band members had been in place in the Leeds scene for some time, and so when, in early 2004, Whiskas asked Tom Woodhead and Robert Canning, then of the Black Helicopters, and in search of a drummer, to join up, they enthusiastically agreed, incorporating Whiskas and sister Katie Nicholls, into the team on drums. Eventually the boys quit their jobs, Katie finished college, and in the Summer of 2005 Russia set their eyes to the road, playing at the Reading and Leeds festivals, and starting on a mammoth cross country tour, which they've only just, briefly, settled down from. The tour took in 37 consecutive dates in the UK, as well as stints in Ireland and the USA, where they got a particularly strong reception, and have been supporting acts like Biffy Clyro, VHS or Beta and We Are Scientists, as well as the Editors, who are now good friends with the band. Talking about the industry brings out a deep funk in Whiskas, but also the practical experience that he has picked up from the scene, which was exactly the reason that he went it alone to set up Dance to the Radio, picking up bands like iLiKETRAiNS and the Pigeon Detectives to the label. Having taken a brief siesta, the band are now nearly ready to tour ‘most of the world’ supporting their debut album Give Me A Wall, (and not anybody else) which is set to put a whole new spin on their extensively performed live act. Forward, indeed - it seems to be.